Nowdays, you can find AJAX topic everywhere. Yes, this method brings more advantage in internet word. Some people say AJAX is not new technology. It just a method. Other people say it is a technology. In this post, we talk about AJAX in preview. 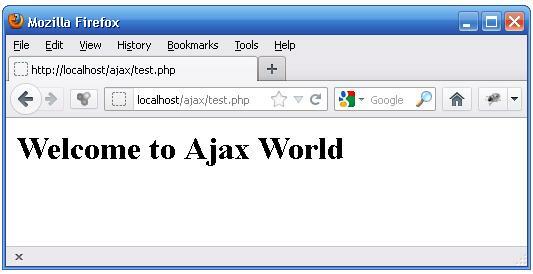 Now, we try to use Ajax in our simple application. First time, we will build simple ajax library. Then, we write page to load the ajax library. This is very basic application. You can still extend it for more complex web. 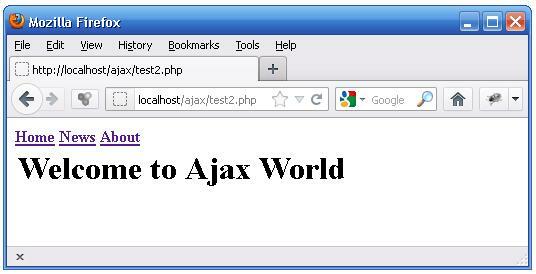 The keystone of AJAX is the XMLHttpRequest object. All modern browsers support the XMLHttpRequest object (IE5 and IE6 use an ActiveXObject). async: true (asynchronous) or false (synchronous) send(string) Sends the request off to the server. Asynchronous – True or False? Sending asynchronous requests is a huge improvement for web developers. Many of the tasks performed on the server are very time consuming. Before AJAX, this operation could cause the application to hang or stop. Using async=false is not recommended, but for a few small requests this can be ok.
To get the response from a server, use the responseText or responseXML property of the XMLHttpRequest object. If the response from the server is not XML, use the responseText property. When a request to a server is sent, we want to perform some actions based on the response. In the onreadystatechange event, we specify what will happen when the server response is ready to be processed. Note: The onreadystatechange event is triggered four times, one time for each change in readyState. Now, we try build links in page. Then, from that links we call web content. This is basic and simple way to use ajax in our web. From this practice, we can see how Ajax works. Now, point your browser to http://localhost/ajax/test2.php. Try click link. We add something that make user know ajax still works. We called preloader. It will help user to know where part of page will change. It also add more attractive to our web. Really helpful. Thank you very much sir.